One Plus has announced on Wednesday that its much awaited One smart phone will be made available for purchase in India from December 2nd which is Tuesday and will be on sale exclusively through Amazon.in. And if you are the one looking for purchasing One Plus One in India then you have to first get an invite and people only with Invites can purchase One Plus One through Amazon.in on 2nd December in India. All you have to do now is wait for the Invite which will be sent to your mail if your mail id is selected from the draw. And you can then purchase the device on December through Amazon India. This is similar to the invite and purchase system followed by Xiaomi which will only let you purchase their device if you have registered for an invite. 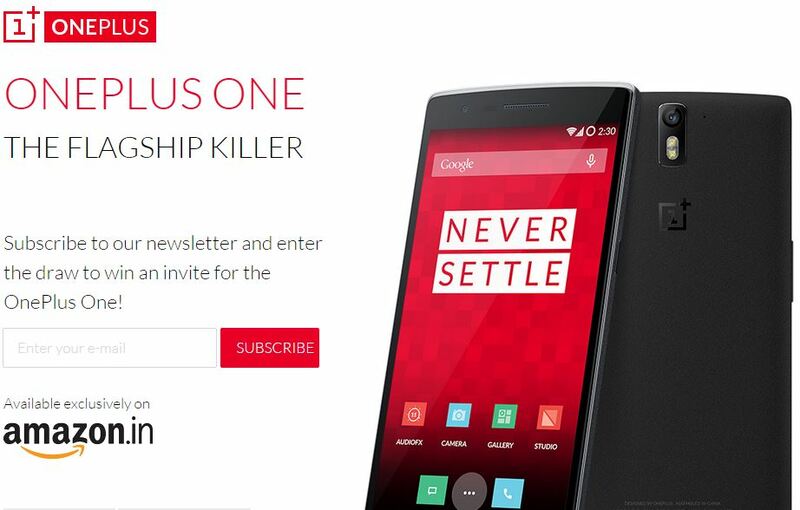 There is a lot of demand and craze for OnePlus One which everyone are calling as a Flagship killer mainly because of the features which are offered at the price it is being sold. And another main factor is the presence of CyanogenMod 11S as the OS which is based on Android Kitkat 4.4 which everyone knows keep giving regular OTA updates to bring bug fixes and also include new and latest features. And coming to the features of the device it comes with a 5.5 inch IPS LCD display which has 1080 x 1920 pixels resolution having a pixel density of 401ppi. The Display is protected from regular wear and damage by Corning Gorilla Glass 3 protection. The devices comes with an impressive Qualcomm Snapdragon 801 processor which clocks 2.5GHz with Adreno 330 GPU and it is supported by 3GB of RAM. The device comes with a 13MP primary or rear facing camera which has IMX214 sensor with six lenses and f/2.0 aperture that boasts quick shutter speed of only 0.3-seconds. It comes with a 5MP front facing camera. The device comes with 64GB of internal memory which cannot be expanded further, it is powered by 3100 mAh non-removable battery and has all the other basic smartphone features like $G LTE, WiFi 802.11 a/b/g/n/as, Bluetooth 4.0 and NFC functionality. The pricing of the device is not yet confirmed but it is rumoured to be below Rs. 25,000 in the Indian market for the 64GB model on its release on December 2nd.